Another legal skirmish has broken out over the upcoming Martin Scorsese all-star drama The Wolf of Wall Street. Days after Scorsese was sued by a producer who claimed the director backed out of another project to take on the Leonardo DiCaprio-Jonah Hill drama about New York stockbrokers, The Hollywood Reporter has leaned that the production company behind the film has traded lawsuits with a producer on the project over whether she has been excluded. Alexandra Milchan and her EMJAG Productions filed suit Friday in Los Angeles Superior Court claiming that Red Granite Pictures has cut her out of producing the film and has refused to pay her agreed-upon compensation. Also on Friday, Red Granite fired back with its own suit asking a court to declare that it owes "no obligation of any kind" to Milchan. "Emulating the fraud and corruption which permeates the film, defendant Red Granite, the company making the film, now refuses to honor Milchan and EMJAG's rights as a producer after numerous attemps to 'strong-arm' them into accepting a lesser role failed," according to the Milchan complaint, a copy of which was obtained by THR. 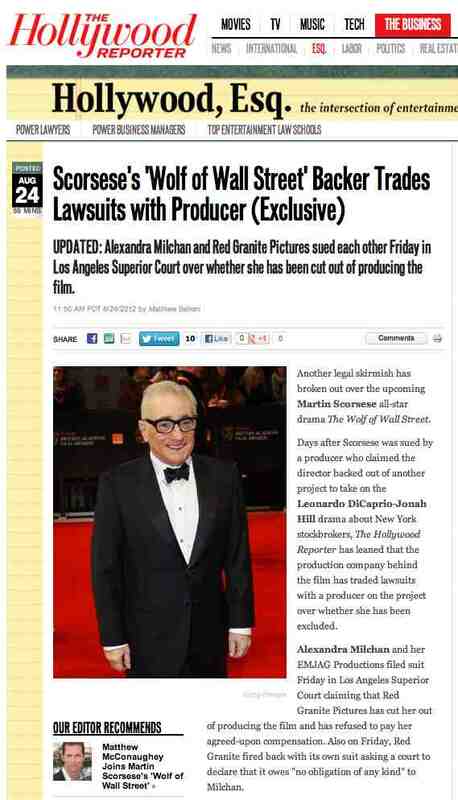 But according to the Red Granite complaint, which THR also has seen, "Despite the fact that no contract exists between Red Granite and Milchan and that Milchan was never engaged by Red Granite to render production services, Milchan nevertheless contends that she is entitled to certain rights in and to the motion picture based upon The Wolf Of Wall Street, including a producer’s fee and producer’s credit." Milchan is a well-known producer and claims to have spent years developing Wolf of Wall Street, based on the book by Jordan Belfort about a securities fraud case incolding corruption on Wall Street. She claims she commissioned the film's screenwriter, Terrence Winter (The Sopranos, Boardwalk Empire) and brought DiCaprio and Scorsese on board. In exchange, she claims she was promised back-end compensation on the film. She alleges that in 2007 she signed a deal with Warner Bros. that specifically laid out the terms of her compensation and credit. When Red Granite took over the project from Warners in 2011, Milchan says Red Granite also took on the obligations to her, including $700,000 in fixed compensation and the right to produce the film. But Red Granite allegedly reduced her pay to $250,000, refused back-end compensation and banished her to an executive producer credit. She claims she also has not been allowed to participate as a producer on the film. Milchan says Red Granite never intended to honor its obligations to her. 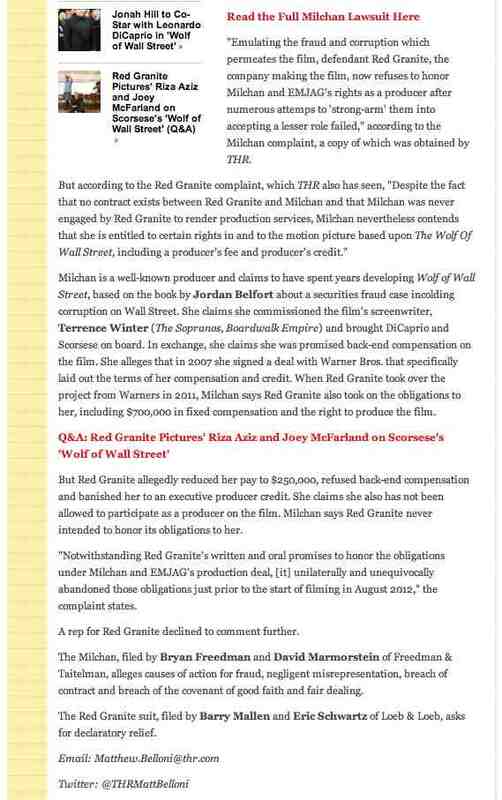 "Notwithstanding Red Granite's written and oral promises to honor the obligations under Milchan and EMJAG's production deal, [it] unilaterally and unequivocally abandoned those obligations just prior to the start of filming in August 2012," the complaint states. A rep for Red Granite declined to comment further. The Milchan, filed by Bryan Freedman and David Marmorstein of Freedman & Taitelman, alleges causes of action for fraud, negligent misrepresentation, breach of contract and breach of the covenant of good faith and fair dealing. The Red Granite suit, filed by Barry Mallen and Eric Schwartz of Loeb & Loeb, asks for declaratory relief.